I love a great road trip and when I see the opportunity, I seize the moment! The weather was great and the amazing Selena was available with only a day notice. Selena is a dear childhood friend of mine who is always up for an adventure. So I packed some snacks and a new product I had for review-TheCozy Pocket Blanket and off we went, into the Texas Hill Country. I realized the weather was going to be perfect to visit a favorite spot of mine, Hamilton Pool Preserve. Hamilton Pool Preserve was designated a nature preserve by the Travis County Commissioner’s Court in 1990. Located 3/4 mile upstream from its confluence with the Pedernales River, Hamilton Creek spills out over limestone outcroppings to create a 50 foot waterfall as it plunges into the head of a steep box canyon. The waterfall never completely dries up, but in dry times it does slow to a trickle. However, the pool’s water level stays pretty constant, even during periods of drought. I think you can understand why this place is a favorite on my list of “magical outdoor spaces“. The pool trail is 1/4 mile in length and includes a series of rock steps descending into the canyon. The trail is rugged and steep. Sturdy foot gear is recommended. Visitors with physical disabilities can arrange assistance into the canyon by requesting a ride by preserve staff. The ride takes a visitor into the canyon, but not all the way to the pool, since no vehicle can make it to the pool. Make sure to check out the website for do’s and dont’s and frequently asked questions. I thought this would be a perfect place to test out TheCozy Pocket Blanket. This was actually very easy to carry since it literally weights 7.5 ounces and fits right in the palm of your hand. I love how easy it was to pack and set up. TheCozy is water resistant and this is great for me because my favorite Texas travels usually include a river. 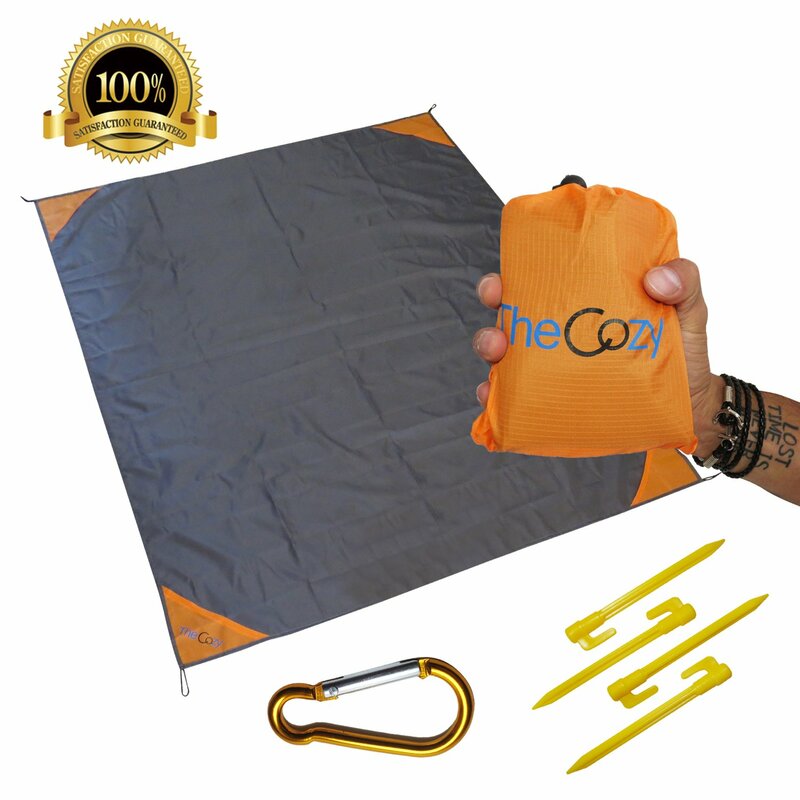 TheCozy Blanket comes with 4 ground stakes and a nice colored orange bag to put it back into. The material is high quality water resistant and we had no problems setting it up and putting it back in the bag. This is definitely a new addition for me and I am sure you will see it on some of my future adventures. A perfect stocking stuffer or just a nice gift for yourself. Practical and chic with a great price. Check out TheCozy at Amazon. Keep it simple, keep it real!! Just for the Holidays use LATINOUT for a 10% discount. Valid until 1/1/2018. Fitfunand … Josie reviewed and approved! (I was given TheCozy for a review but no worries all opinions are my own as are my adventures). This entry was posted in Latina Outdoors, Travels and tagged Hamilton Pool Preserve, Lifestyle, Product Reviews, Texas Parks, TheCozy. Bookmark the permalink.